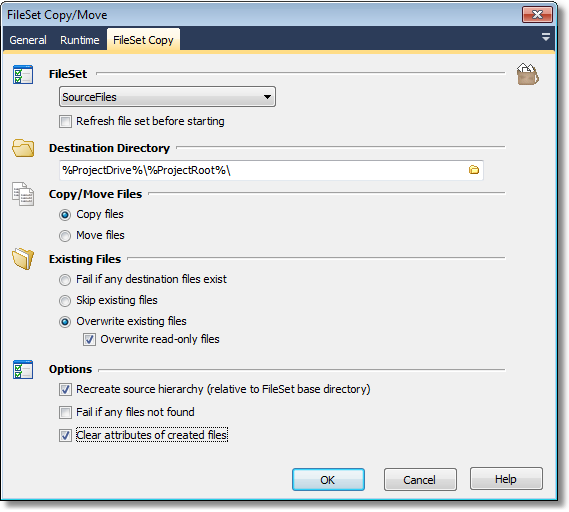 The Copy/Move FileSet action allows you to copy or move all the files in a FileSet to a new location. Refresh FileSet before starting - if this option is set the FileSet will be refreshed before this action runs. This means it will be recreated by using the patterns/filters from the FileSet Define action. Use this option when it's possible that the files may have changed between when the FileSet was created to the point where you want to copy or move the files in the FileSet. Recreate source hierarchy - if this option is not set, then all the files in the FileSet (regardless of their path) will be placed in the destination directory.